Hmmm, maybe you need to change the z axis value of your actor. It could be that the map is being drawn in front of them. Yes, it should be the 3rd value in the position property. A good idea might be to switch to 3D mode when working with the z axis and then switch back when you are done. It might make it easier to see why something might be displayed on top of something else. Darn, I'm not sure what it is then. Make sure the Z position of the map is not the same as the others. Try setting it to -5. Make sure the Z position of the camera is not the same as the others. Try setting it to 5, or 10. The three boxes are X, Y, and Z. The one on the right is the one we want to change. 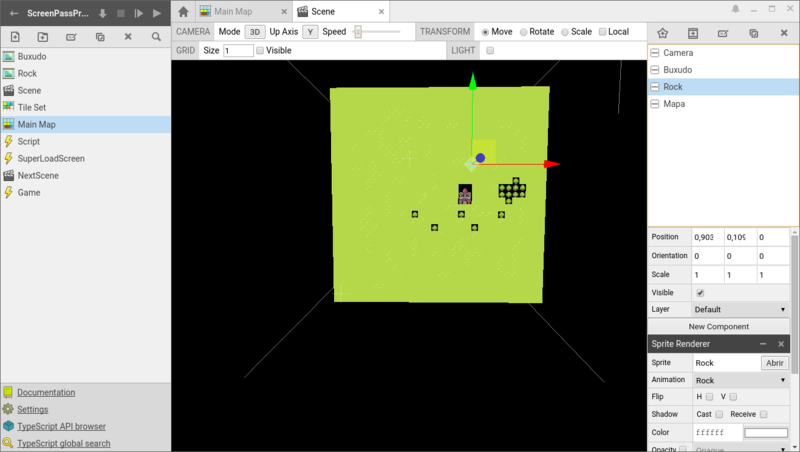 This can be found in the scene editor. Make sure the scene was loaded. If the background is being covered by other tiles even though they are transparent, make sure to put them in another layer. This can be done in the tilemap editor. If the actors are covering the background, make sure the sprites are transparent. You can check this in the sprite asset.